The Ukrainian language dictionary in 20 volumes covers the commonly used vocabulary of modern Ukrainian literary language, common terms, dialecticisms, and word combinations. The sources used in the dictionary reflect the vocabulary of literary texts from the end of the XVIII century to the present day, the Bible, folk art, publicistic writing, popular science and science, the language of the media etc. The Eighth Volume of the Dictionary (L–MISHURNY) contains 9,115 dictionary entries. On May 18, 2017, at the Kyiv House of Scientists of the National Academy of Sciences of Ukraine were held a presentation of the two-volume edition of the "Ukrainian-Georgian-Russian-English-German-French dictionary of metallurgical terms" and a scientific seminar "International "Ukrainian-Georgian-Russian-English-German-French dictionary of metallurgical terms" — cooperation without borders". Together with the E.O. Paton Electric Welding Institute (EWI), ULIF-NAS had compiled and released on CD-ROM in amount of 1000 copies first electronic explanatory "Ukrainian-Russian-English Dictionary of Welding" with advanced semantic and illustrative functions. Rozrobleno (spilʹno z Instytutom elektrozvaryuvannya im. YE. O. Patona NAN Ukrayiny) y vydano na lazernykh dyskakh nakladom 1000 prymirnykiv pershyy elektronnyy tlumachnyy «Ukrayinsʹko-rosiysʹko-anhliysʹkyy terminolohichnyy slovnyk-dovidnyk «Zvaryuvannya» iz rozshyrenymy semantychnymy ta ilyustratyvnymy funktsiyamy. Ukrainian Lingua-Information Fund of NAS of Ukraine (ULIF-NASU) is the Ukraine’s only specialized research institution in the domain of mathematical, applied and computational linguistics. development, implementation and exploration of information systems, data and knowledge bases concerning the domain of culture in general. theory of semantic states is the basis for formalized description of a wide range of linguistic phenomena, combining grammatical and lexicographical description of a language system. developed a systematic approach to the conceptographic systems building. It should be noted, that ULIF-NASU has established, Ukrainian National Linguistic Corpus, the first one in our country, which at present contains about 170 million tokens ant it is a modern experimental basis for the fundamental linguistic studies and lexicographical works of a new generation. Ukrainian Lingua-Information Fund of NAS of Ukraine has in 1994 established a program for creating a set of Ukrainian dictionaries of a new generation – "Dictionaries of Ukraine", which now amounts to 70 publications and 36 electronic systems. We consider that one of the outstanding achievements of the Ukrainian Lingua-Information Fund is the creation and publishing of eleven versions of the first full-scale Ukrainian electronic dictionary – Integrated Lexicographical System "Dictionaries of Ukraine", which contains five dictionary subsystems (word-inflection, transcription, synonyms, antonyms and phraseology) and contains over 256 thousand dictionary entries. 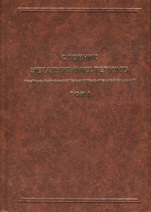 This dictionary is distributed on laser discs, and also is available on the Ukrainian linguistic portal (http://lcorp.ulif.org.ua/dictua/). Among the most important publications of our institution is also worth noting the publishing of I –VI volumes of fundamental academic explanatory "Dictionary of the Ukrainian Language in 20 volumes", which is to contain about 200 thousand word entries altogether. The Dictionary covers the general vocabulary of modern Ukrainian literary language, common terms, dialecticisms, settled expressions. Sources, used in the Dictionary, reflect the vocabulary of fiction texts since the late XVIII century to the present day, the Bible, folk art, publicist texts, popular science and scientific works, the language of mass media etc. This Dictionary has the status of a National Heritage of Ukraine. Experts of our Fund suggest a concept of virtual systems of professional interaction in linguistics and applied linguistics, as well as system and technical principles for compiling virtual lexicographical laboratories (VLL) – special computer tool systems that in the Internet environment provide the coordination of geographically remote researchers working on joint projects. We have created more than 40 virtual lexicographical laboratories, including VLL "Dictionary of Ukrainian language" VLL "Etymological Dictionary of Ukrainian language", VLL "Dictionary of Russian language", VLL "Dictionary of Turkish Language", VLL "Terminological Ukrainian-Russian-English Dictionary of Welding", VLL "Mechanics" and others. We have created and implemented an experimental zone of bilingual Slavic lexicography "Mondilex" (Bulgarian, Slovak, Slovenian, Polish, Russian and Ukrainian languages) VLL – a lexicographical tool system that in integrated mode allows to carry out a full lexicographical cycle of compiling the bilingual dictionaries for the above languages (forming of a word register, updating, modification, editing of dictionary entries and its structure, the quick search by word units or phrases). ULIF and V. M. Glushkov Institute of Cybernetics of NAS of Ukraine have successfully implemented Ukrainian National Linguistic Corpus on a supercomputer SCIT-3. This offers great opportunities for the whole knowledge industry, in particular compiling ontologies of different subject areas, informatization of education and intellectual processes. Also, our scientists have established a parallel Russian-Ukrainian Linguistic Corpus of the New Testament text and published it ("Eternal Gospel"), developed a theoretical framework for designing a conceptographic system of the Holy Scripture. Together with the Vernadsky National Library and the Institute for the Ukrainian Language of NAS of Ukraine, Ukrainian Lingua-Information Fund of NAS of Ukraine published two editions of a transliterated handwritten artifact of the old Ukrainian language and the 16th century art "Peresopnytsia Gospels" with its scientific processing (sorting, researching and word index). Ukrainian Lingua-Information Fund of NAS of Ukraine is the basic organization of the Scientific Council of NAS of Ukraine on the problems of "Information. Language. Intelligence" and the Ukrainian National Commission for Spelling, a co-founder of the scientific-theoretical journal "Movoznavstvo". Ukrainian Lingua-Information Fund of NAS of Ukraine jointly with the Vernadsky National Library and the Scientific Council of NAS of Ukraine on the problems of "Information. Language. Intelligence" organizes and holds International scientific conferences “Megaling. Horizons of Applied Linguistics and Linguistic Technologies" which are the only international conferences on structural, applied and mathematical linguistics in Ukraine. A high scientific level, participation of famous scientists and specialists from many countries make these conferences a significant event in the scientific life of Ukraine.